Protagonists are the people who we in Bollywood refer to as the Heroes. The basic plot line of most movies works around how the Hero beats the Antagonist or the ‘Villain’ as we may say and wins the Heroine with a happily ever after. In such a scenario, rarely do we ever come across heroes who play a role of the protagonist and end up dying by the end of the Film. Not many choose to do that, do they? But, for our King Khan there have been times when he has made the impossible possible and ended up dying in movies leaving his fans with a slight feeling of loneliness and sadness. 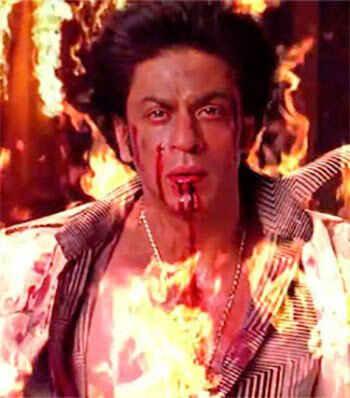 SRK with his immense charm and abilities of winning over with his skills, he did die in a few films and gave the basic movie plot an unexpectedly wonderful twist. This is a movie that gives us a hint of how the negative character of Ajay Sharma/ Vicky Malhotra played by SRK had a positive motivation to it. By the end of the film when SRK dies in his mother’s arms confessing her about how he had craved for her love brings tears in our eyes, and we start sympathizing with him. Yeah well, this classic was something that got our minds and respect so high for King Khan which is not even comparable to anything else. His acting, his dedication and his passion towards making the role that he played an utter success is what makes us love him to the core. By the end of this movie, with Aishwarya Rai/ Paro running down the passageways of her Haveli and Shahrukh Khan/ Devdas lying there below a Chaupal outside her house, was the scene that not a single person would let go off their mind. 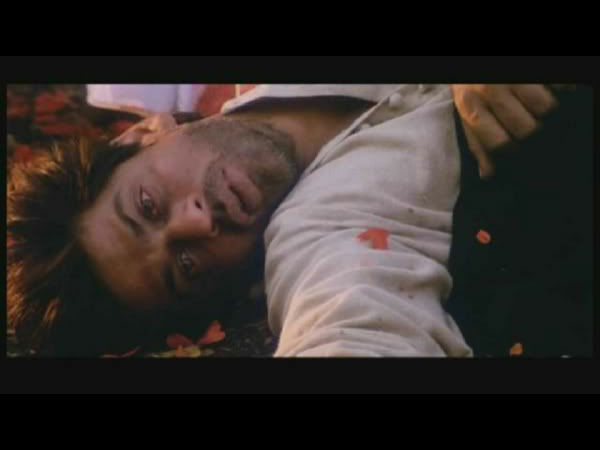 Devdas dies with his last word, calling out to “PARO” and his poem that pierces right through our hearts wanting him to come back to life. Aman Mathur, how can a person be so giving and full of love?? SRK gave us the hopes of how true love can last even after one’s death. He was the one who made us realize and value the worth of love, life and death through this single movie. Even today, after having watched the movie for a hundredth time we have tears rolling down our cheek in silence without the ability to utter a word from our mouth by the end of the movie. A junior artist Om who dies while making an attempt to save his dream girl, Shanti. It was a tragedy, yes. But then, the movie has it’s whole twist with the re-entry of Om Kapoor played by SRK so as to take a revenge for deaths caused by Mukesh the Antagonist. Even though SRK died in the first half we were glad to have his come back with the ‘six-pack abs’ for the latter part, didn’t we? Apart from these above mentioned movies; ‘Raees’, ‘Fan’, ‘Anjaam’, ‘Karan Arjun’, ‘Ram Jaane’, ‘Dil Se…’, ‘Shakti: The power’ are another special mentions that we cannot let go as they too are the best played movies by our very own King Khan. LOVE you SRK… We really hope to see you in your new avataar soon in the near future! !